Kid Andersen Stone Bender video demo! 3 Carefully selected, matched and auditioned Germanium Transistors. ThroBak Stone Bender MKII details and Sola Sound Tone Bender MKii history. 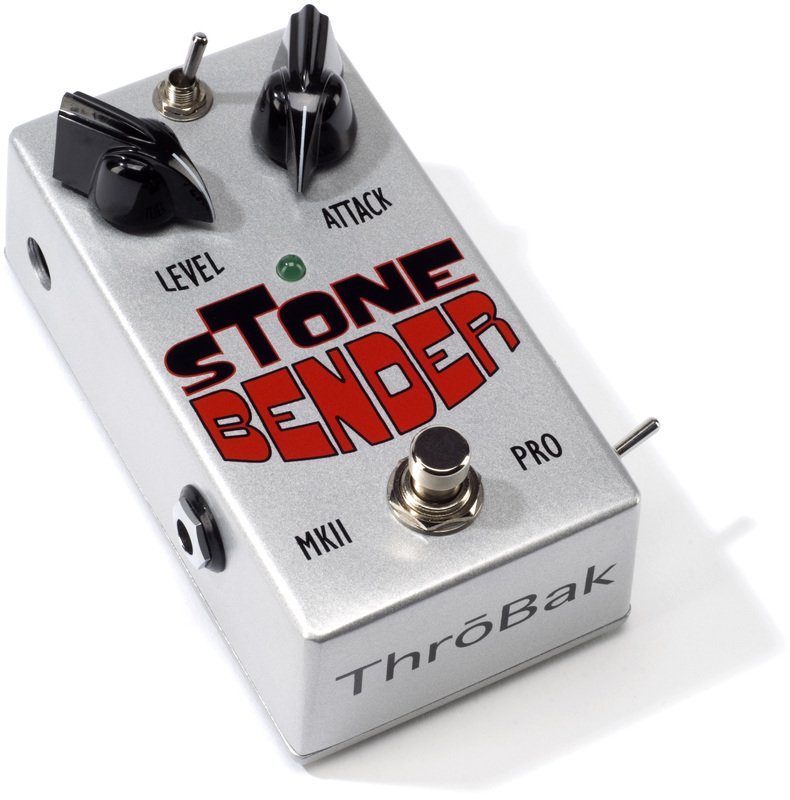 Throbak Electronics guitar effects pedals offers the Stone Bender MKII Pro stompbox, a faithful tonal reproduction of the fabled 3 germanium Sola Sound Tone Bender MKii Professional used by Jimmy Page and Jeff Beck. We have added several features that allow you to customize the Stone Bender guitar effects pedal to create your own Signature Sound. Jimmy Page, Jimi Hendrix and Brian May had Roger Mayer and Peter Cornish customize their effects to create their own signature sound. These players could not easily get these custom tones from the pro guitar shop of the day. But now we give you this same pro level of control to the base level Sola Sound Tone Bender MKii circuit with the ThroBak Stone Bender guitar effects pedal. A pre gain switch makes this a great overdrive pedal as well as a monster high gain fuzz box that gives endless sustain and usable feedback. Also included is a user adjustable internal bias pot. We also included a new feature, the Tone Color switch. It takes a touch of treble edge off the tone when activated. It is reminiscent of the tones from the better three knob Color Sound Tone Bender when activated. The original Sola Sound Tone Bender MKii circuit remains. However ThroBak guitar effects pedals have tamed these inconsistencies of the vintage Sola Sound Tone Bender MKii and put the tone changing variables within your control so you can create your own signature sound with this classic ThroBak guitar effects pedal. * Free Shipping in the USA for all orders. - *Free international for orders over $200. Sign up for the ThroBak newsletter and get the latest product information.